For many decades William Hill has been one of the most recognised – and popular – bookmakers in the United Kingdom. So it is no surprise that they are becoming a recognised player in the Canadian market as well. They offer total coverage in sports betting, from the ‘Big 4’ sports (NHL, MLB, NFL & NBA) to world soccer, tennis and horse racing. You can bet on anything from politics to Irish hurling, from The Oscars to the next pope – they really have it all covered. Crucially though – and this is a must for me – the website is really easy to use and navigate through. 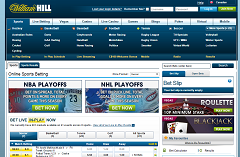 After operating for so many years as a bookmaker (founded in 1934) it is clear that William Hill knows its business and knows what to offer its customers – choice of markets and great odds all in a simple, easy to use website. William Hill is slightly behind the big 3 players in the Canadian sports betting market, but they’re actively pursuing gaining a bigger Canadian market share and as such a strong sportsbook worldwide, I’m excited to see them really push into Canada in the future. William Hill offers new Canadian customers a 100% matched first deposit bonus up to $100. In order to receive this bonus you must use promo code CAD100 at registration (more on the William Hill promo code here). The bonus will then be available in your account within an hour. This is a definite plus as there are many online sportsbooks that don’t release your bonus until you’ve wagered a certain amount. You must turn over the bonus amount four times before making a withdrawal. This may sound like a lot, but if you bet normally you will clear the bonus in no time. If you are going to talk about Canadian sports then you have to start with the national pastime – ice hockey. It is clear that William Hill is aware that this is the most popular sport in Canada as it is heavily promoted on the website. They offer markets on everything from the Stanley Cup winner to live betting on puck lines, money lines and handicap betting. It’s not just the NHL either, William Hill has markets available for betting on the AHL, European leagues and international matches. All other sports are really well covered too – including NBA, NFL, MLB and the increasingly popular MLS. Just like with ice hockey, WilliamHill.com has a varied range of ways to bet on these sports, all with great odds. Live In-Play betting has become increasingly popular with sports fans over the last few years, and William Hill has got ahead of the market very quickly. They offer literally hundreds of different live betting markets across many different sports. Moreover, you can use their live streaming service (WHTV) so you can bet live and watch the sporting event at the same time. Of course there are some territory restrictions but I was genuinely surprised at the sheer number of sports events I could watch live. For a bookmaker to offer live online betting the product must be good – long delays, technical problems could potentially turn off bettors. Thankfully William Hill has developed a sleek, reliable and technically advanced system perfect for live betting. I also really liked the “Cash In” option, which means that you can get a profit (or cut your losses) on your bet before the event has actually ended. This works really well with live betting as you have control of your bet if you feel the momentum in an event is beginning to change against you. Just like live betting, mobile betting is becoming increasingly popular amongst bettors. You can access William Hill’s mobile site or you can download the William Hill app for IOS or android phones, and of course it is available for use on IPad and other tablets. Once again I found the William Hill mobile product to be just as effective as the desktop site. The navigation is simple and you can access all the great markets and betting options with just a few taps of your finger. I was also impressed with the ease of access to my account information, as I have encountered other mobile betting apps that do not give as much access as you would find on the full desktop site. Deposits directly from your bank account: InstaDebit, UseMyBank or Wire Transfer. Deposits from a third party ewallet: ClickandBuy, FundSend, Entropay or paysafecard. The online help centre which is easily accessed through the William Hill website has information on all the many different deposit options. There is a minimum deposit of $10 and William Hill also provides you with maximum deposit limits so you can remain in control of how much you spend. William Hill has a dedicated customer service team that is available to assist customers all day, every day. Customers with any questions or issues can contact the support team by email, telephone or use the live chat service. I found the live chat service especially helpful, when I wanted to put a maximum deposit limit on my account a customer service agent was able to take me through the steps, quickly and effectively. William Hill also has an extensive online help centre that can provide the answers to many questions without the need to contact an agent, all the major FAQs are covered in a clear and succinct manner.